← Nakhon Ratchasima, Thailand. January 5th, 2010. Frostproof, Florida. January 11th, 2010. 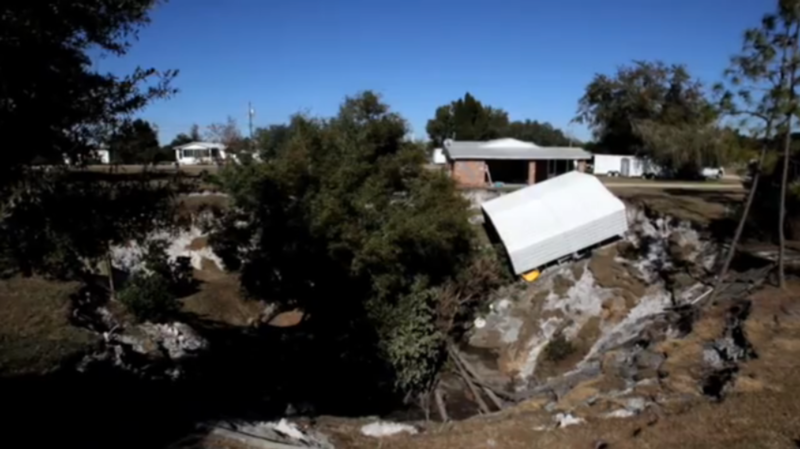 A 90-foot-wide sinkhole swallowed a carport in Frostproof on Monday and nearly took down the nearby house. And it all happened in less than two hours. Cory Greenway, who lives at 1600 County Road 630 West with his 72-year-old father, Bobby, said he knew it was bad about 9:30 a.m. when he saw the ground pulling away from the free-standing carport, near the family’s well. Cory Greenway and his neighbors rescued a four-wheeler from the carport before the structure tumbled about 50 feet into the sinkhole. They backed two trailers up to the house, took out the sliding glass doors and brought as much out of the newly renovated house as they could. Cory Greenway, 29, said he could see the walls of the sinkhole expand as he moved things from the only home he’s ever known. As a precaution, authorities evacuated three mobile homes in the Southern Pines Resort that abuts the Greenway property. The residents were soon cleared to go home. The Sheriff’s Office also briefly closed County Road 630. Polk sheriff’s Lt. Rodney Chauncey said Monday night that the sinkhole slowly continued to expand through the day, but hasn’t caused any additional damage.